Have you ever played Robert Kiyosaki’s Cashflow 101 game and wondered how you can get out of the rat race with real estate, for real? Look no further, I’ll show you how to do it in real life, below. 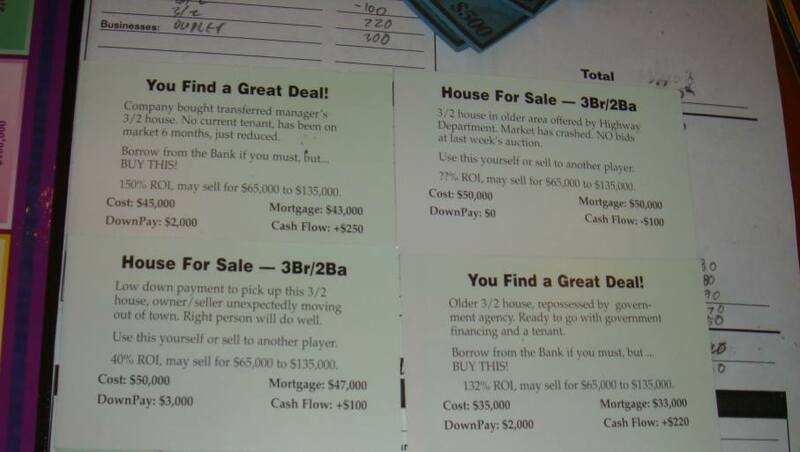 “If only it were this easy in real life!” , a Think Rich Pinoy Seminar attendee exclaimed after buying his fifth property while playing Robert Kiyosaki’s Cashflow 101 game. 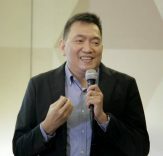 I heard him say this as I helped facilitate the Cashflow 101 game at their table during the afternoon session of the Think Rich Pinoy seminar last February 27, 2010. In real life however, how do you find those “opportunities”? It’s obvious that I get my opportunities from listings of foreclosed properties. Let us first dissect an opportunity card. If you will look closely at the opportunity cards above, aside from a brief description of the property, the projected ROI, Cost, Mortgage, Downpayment, and Cash flow are already given. 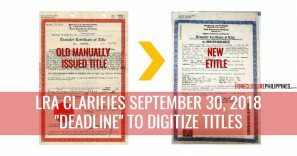 In real life, the only numbers you will often find on listings of foreclosed properties are the Cost (or the selling price or minimum bid price), Downpayment, Interest Rates, and the maximum loan term. The mortgage amount is usually the Cost less the Downpayment (which is also equal to the loan amount). 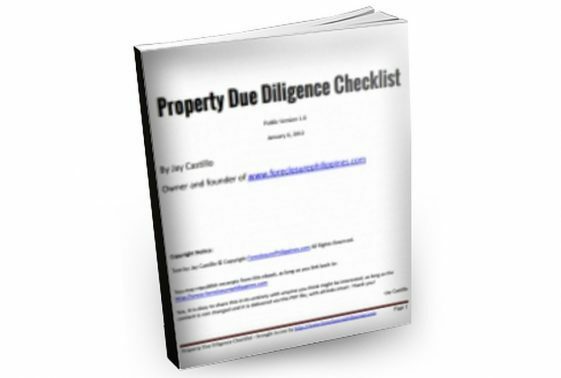 You will have to come up with estimates or calculate for the projected ROI, and Cash flow. Without these numbers, you will have no objective way of telling if a foreclosed property has a good potential to be an income generating asset. In real life, we can also get the ROI using the same formula above but we must first determine the projected monthly cashflow. An overly simplified way of determining the monthly cash flow would be to subtract the monthly amortizations from the monthly rental income. We therefore need to determine these two numbers first. Note: In real life, you have to consider other things like vacancy rates, collection losses, property management, maintenance reserves, taxes and insurance, etc. 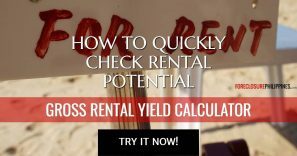 You can get the monthly rental income by asking around the same location of the target property and get rental rates for comparable or very similar properties. 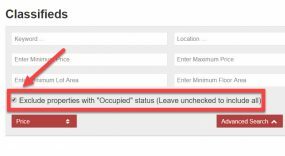 This would even be easier for condo units as you just have to check for the rental rates for units in the same building. This can also be done online by checking advertisements of rental properties in the same building or area, but you have to remember that these are asking prices that have room for negotiations (most of the time). Monthly amortizations can be easily calculated using amortization calculators since we know the loan amount, interest rate, and loan term. You can use our very own amortization calculator which can be found here. Let’s use the following foreclosed property from the sample listing above and see if we can turn it into a real “opportunity”. Interest rate is 12% interest p.a. *Remember that these are just assumptions and are for illustrative purposes only. One should get the actual values by calling the bank. 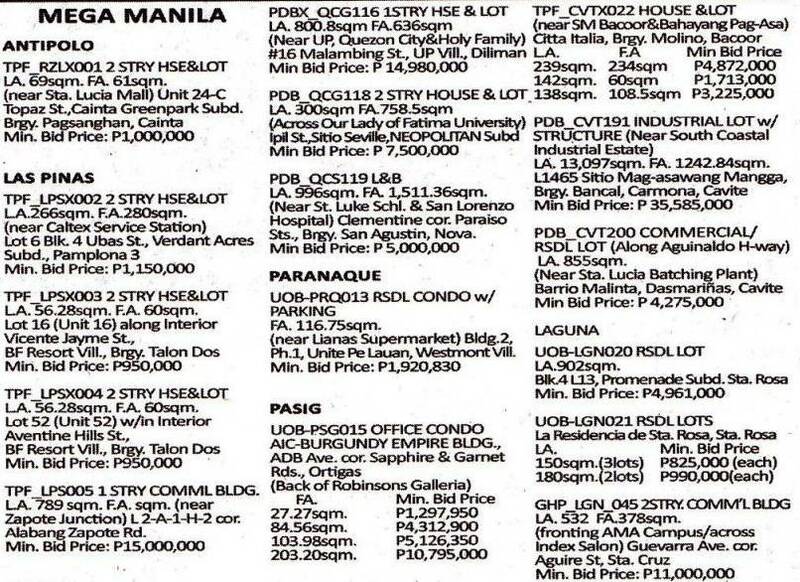 For the location of sample property above, I saw an ad for a smaller sized condo in the same building with an advertised rent at Php25,000 per month. I’m not entirely sure if the rental rate on the ad I saw was not overpriced but it will have to do for now. It would really be a big help if you focused in a particular area and became very familiar with rental rates, etc. 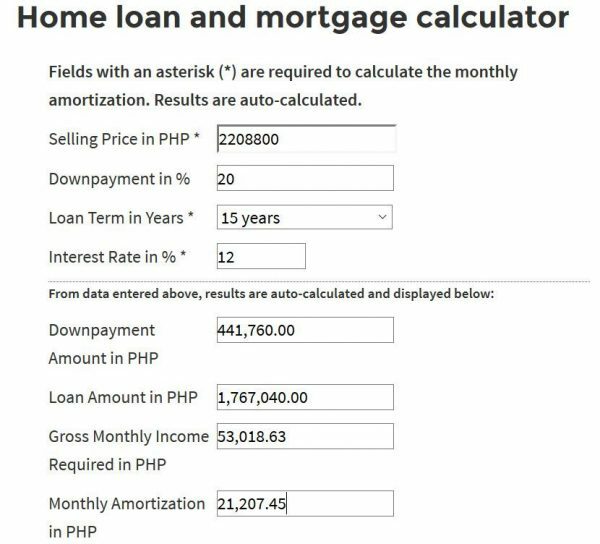 Using our mortgage calculator, the monthly amortization for a property with a minimum bid price of Php2,208,800.00 with a downpayment of 20% or Php441,760.00, and with the balance payable in 15 years at 12% interest p.a would be Php21,207.45 per month, as seen below. The monthly cash flow would be equal to the monthly rent less the monthly amortization. You found a bank foreclosed condominium unit in Makati! 10.30% ROI, may sell for ???? It really is possible to get opportunities in real life, just like the opportunity cards in Cashflow 101. All you need is just a little know-how in “doing the numbers“. The “opportunity” we got above is an overly simplified example as we also need to consider property management, maintenance reserves, real property taxes, and other expenses when calculating for cashflow. 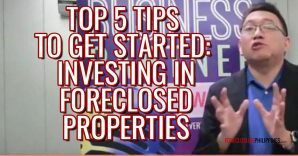 As to whether the “opportunity” we got above is a good deal or not still depends on each individual real estate investor’s preference or target ROI. Is 10% a good enough ROI for you? The ROI can still drastically change when some numbers change and this can turn a mediocre deal into a great deal or it can also transform a good deal into a bad one. What if the exit strategy was changed to rent-to-own instead of rental and the monthly rent-to-own income was Php28,000/month? Or what if the monthly dues plus other incidental expenses turned out to be Php5,000 per month and may thus result in a negative cash flow? I suggest you run the numbers and check the results. Remember, the numbers don’t lie. So the next time you come across a listing of foreclosed properties, just do the numbers! The more consistent you are with doing the numbers, the greater the chances that you may just find that “opportunity” you have been looking for! Text by Jay Castillo. Copyright © 2016 All rights reserved. PS. – Are you a new visitor? 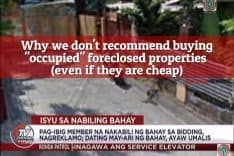 Click here NOW to start learning more about foreclosure investing in the Philippines.